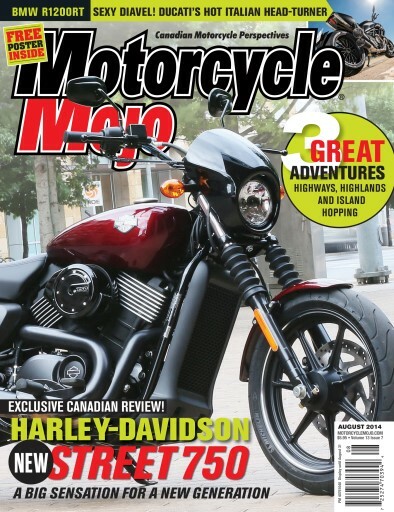 Motorcycle Mojo’s August issue features Harley-Davidson’s newest family member, the Street 750. The reasonably priced Street 750 and 500 are aimed a new generation of rider wishing to fly the legendary Bar and Shield logo. Also in this issue we report on the liquid-cooled BMW R1200RT and the revised Ducati Diavel. 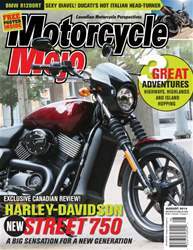 Three travel articles take place from the Canadian and American northwest, as well as the Haliburton Highlands and the Ottawa Valley, which features some of Ontario’s best riding. The third travel piece takes place on the Îles de la Madeleine, a Quebec-owned archipelago of seven main islands in the Gulf of St Lawrence.